Photo: Members of Shujan at a roundtable discussion at the Jatiya Press Club on Sunday. 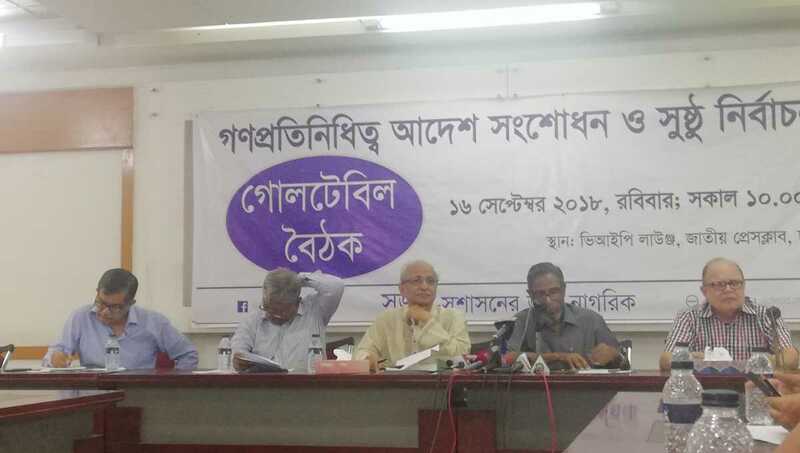 Dhaka, Sept 16 : Using the RPO as a ‘weapon’ against any individual or political party will hinder fair election, said civil rights body Shushashoner Jonno Nagorik (Shujan) on Sunday. “Representation of the People Order (RPO) of 1972 is the most significant law during any election and it should not be misused,” said Shujan Secretary Badiul Alam Majumder at a roundtable discussion. Shujan organised the roundtable discussion titled ‘Amending the Representation of the People Order, 1972 and Fair Election’ at the Jatiya Press Club. Provisions should be included to register nomination papers online, register income tax details of female candidates for the reserved seats, ensure punishment if anyone provides fake information in one’s nomination paper and introduce guidelines for social media to avoid any propaganda. Chief coordinator of Ganasanghati Andolan Junaid Saki, Advocate Subrata Chowdhury, Barrister Jyotirmoy Barua, Prof CR Abrar of Dhaka University’s International Relations and Shujan member Syeda Rizwana Hasan also spoke on the occasion.